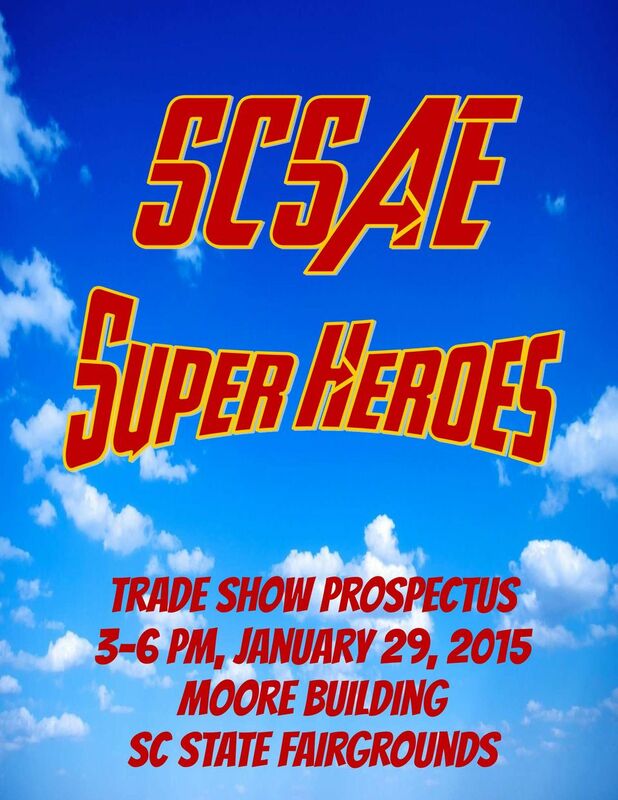 Download "Trade Show Prospectus 3-6 PM, January 29, 2015 Moore Building SC State Fairgrounds"
3 1. Reservation for space: The trade show will be a planned layout designed to mimic the southeastern region. The committee will group exhibitors by region. Blocks may be purchased and the CVB requesting the block must: Submit the contracts with your booth request (one payment may be provided or contracts may list individual payment) Include a list of companies participating in your block SCSAE reserves the right to adjust the layout of the show if necessary. The early bird deadline is November 30, Payment and cancellation policy: Exhibit fees must be paid in full with signed contract. Cancellations received before December 15, 2014 will receive a 50% refund and must be received in writing. NO refunds will be issued after December 15, 2014 unless SCSAE is able to resell your space. 3. 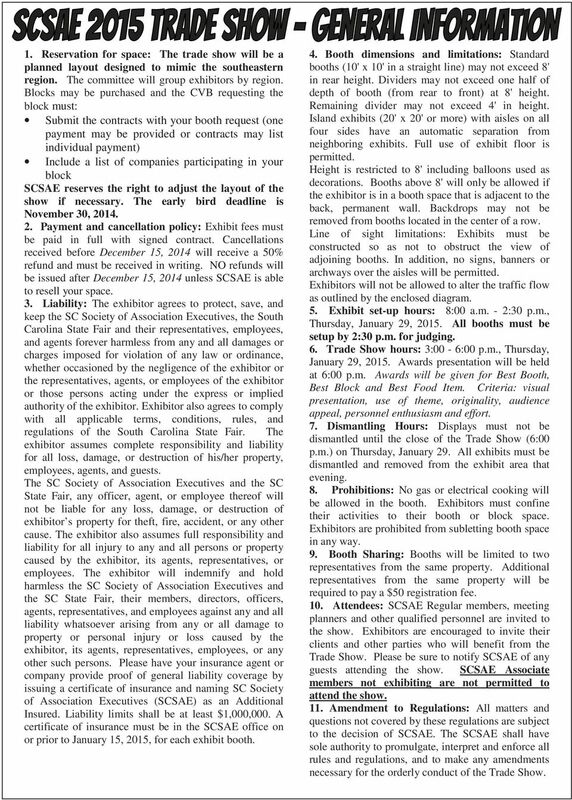 Liability: The exhibitor agrees to protect, save, and keep the SC Society of Association Executives, the South Carolina State Fair and their representatives, employees, and agents forever harmless from any and all damages or charges imposed for violation of any law or ordinance, whether occasioned by the negligence of the exhibitor or the representatives, agents, or employees of the exhibitor or those persons acting under the express or implied authority of the exhibitor. Exhibitor also agrees to comply with all applicable terms, conditions, rules, and regulations of the South Carolina State Fair. The exhibitor assumes complete responsibility and liability for all loss, damage, or destruction of his/her property, employees, agents, and guests. The SC Society of Association Executives and the SC State Fair, any officer, agent, or employee thereof will not be liable for any loss, damage, or destruction of exhibitor s property for theft, fire, accident, or any other cause. The exhibitor also assumes full responsibility and liability for all injury to any and all persons or property caused by the exhibitor, its agents, representatives, or employees. The exhibitor will indemnify and hold harmless the SC Society of Association Executives and the SC State Fair, their members, directors, officers, agents, representatives, and employees against any and all liability whatsoever arising from any or all damage to property or personal injury or loss caused by the exhibitor, its agents, representatives, employees, or any other such persons. Please have your insurance agent or company provide proof of general liability coverage by issuing a certificate of insurance and naming SC Society of Association Executives (SCSAE) as an Additional Insured. Liability limits shall be at least $1,000,000. 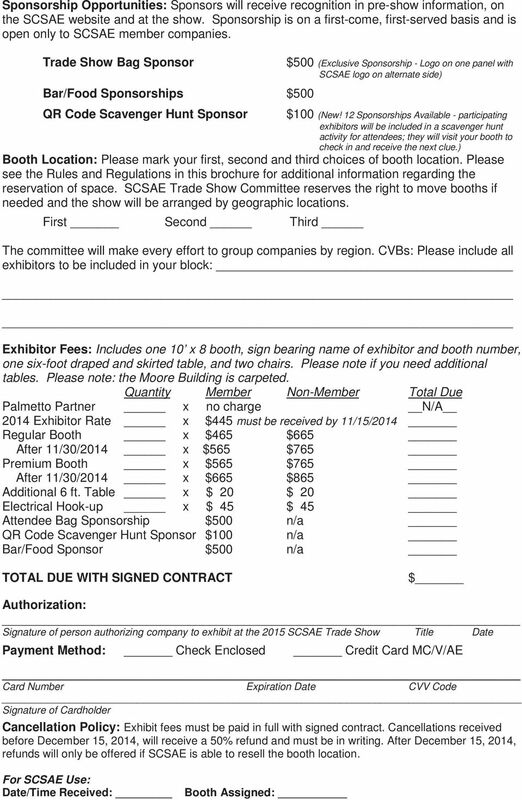 A certificate of insurance must be in the SCSAE office on or prior to January 15, 2015, for each exhibit booth. 4. Booth dimensions and limitations: Standard booths (10' x 10' in a straight line) may not exceed 8' in rear height. Dividers may not exceed one half of depth of booth (from rear to front) at 8' height. Remaining divider may not exceed 4' in height. Island exhibits (20' x 20' or more) with aisles on all four sides have an automatic separation from neighboring exhibits. Full use of exhibit floor is permitted. Height is restricted to 8' including balloons used as decorations. 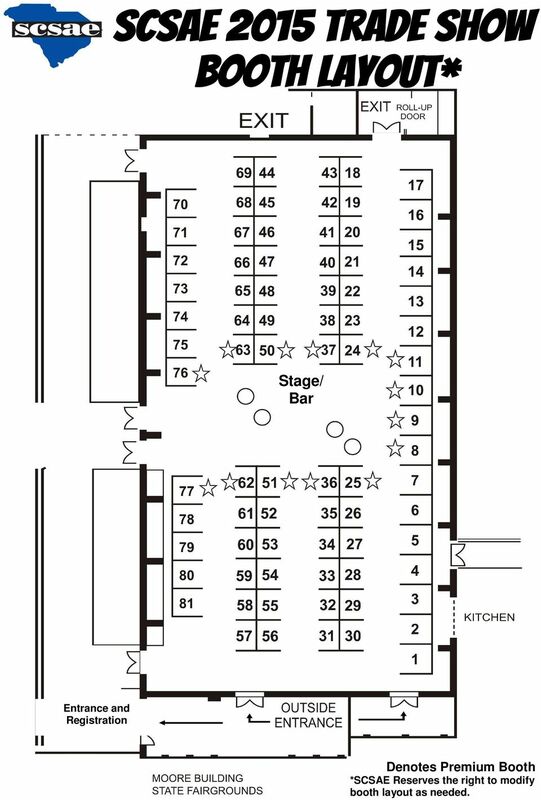 Booths above 8' will only be allowed if the exhibitor is in a booth space that is adjacent to the back, permanent wall. Backdrops may not be removed from booths located in the center of a row. Line of sight limitations: Exhibits must be constructed so as not to obstruct the view of adjoining booths. In addition, no signs, banners or archways over the aisles will be permitted. Exhibitors will not be allowed to alter the traffic flow as outlined by the enclosed diagram. 5. Exhibit set-up hours: 8:00 a.m. - 2:30 p.m., Thursday, January 29, All booths must be setup by 2:30 p.m. for judging. 6. Trade Show hours: 3:00-6:00 p.m., Thursday, January 29, Awards presentation will be held at 6:00 p.m. Awards will be given for Best Booth, Best Block and Best Food Item. Criteria: visual presentation, use of theme, originality, audience appeal, personnel enthusiasm and effort. 7. Dismantling Hours: Displays must not be dismantled until the close of the Trade Show (6:00 p.m.) on Thursday, January 29. All exhibits must be dismantled and removed from the exhibit area that evening. 8. Prohibitions: No gas or electrical cooking will be allowed in the booth. Exhibitors must confine their activities to their booth or block space. Exhibitors are prohibited from subletting booth space in any way. 9. Booth Sharing: Booths will be limited to two representatives from the same property. Additional representatives from the same property will be required to pay a $50 registration fee. 10. Attendees: SCSAE Regular members, meeting planners and other qualified personnel are invited to the show. Exhibitors are encouraged to invite their clients and other parties who will benefit from the Trade Show. Please be sure to notify SCSAE of any guests attending the show. 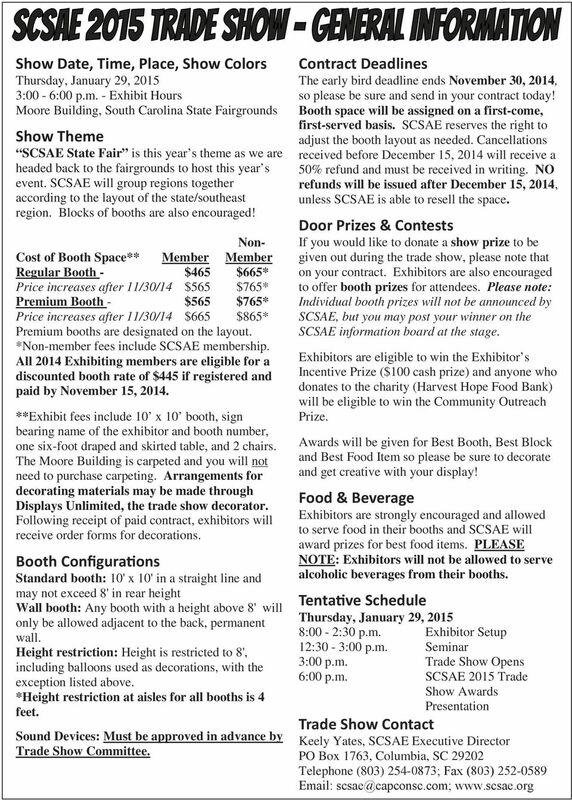 SCSAE Associate members not exhibiting are not permitted to attend the show. 11. Amendment to Regulations: All matters and questions not covered by these regulations are subject to the decision of SCSAE. The SCSAE shall have sole authority to promulgate, interpret and enforce all rules and regulations, and to make any amendments necessary for the orderly conduct of the Trade Show. 4 Stage/ Bar Entrance and Registration Denotes Premium Booth *SCSAE Reserves the right to modify booth layout as needed. 5 Please print or type all information and return form with full payment to: SCSAE, PO Box 1763, Columbia, SC Questions? 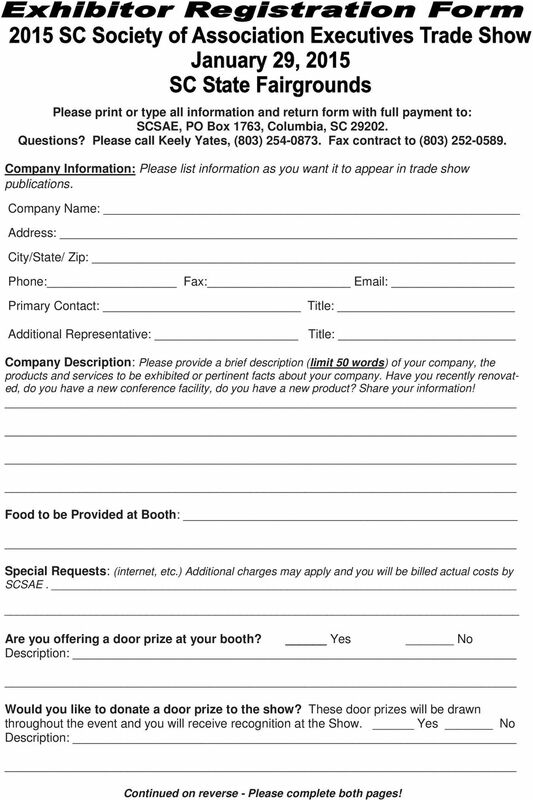 Please call Keely Yates, (803) Fax contract to (803) Company Information: Please list information as you want it to appear in trade show publications. Company Name: Address: City/State/ Zip: Phone: Fax: Primary Contact: Title: Additional Representative: Title: Company Description: Please provide a brief description (limit 50 words) of your company, the products and services to be exhibited or pertinent facts about your company. Have you recently renovated, do you have a new conference facility, do you have a new product? Share your information! Food to be Provided at Booth: Special Requests: (internet, etc.) Additional charges may apply and you will be billed actual costs by SCSAE. Are you offering a door prize at your booth? Yes No Description: Would you like to donate a door prize to the show? These door prizes will be drawn throughout the event and you will receive recognition at the Show. Yes No Description: Continued on reverse - Please complete both pages! 68th Society for Range Management International Annual Meeting & Trade Show Managing Diversity January 30-February 7, 2015 Sacramento, California http://rangelands.org/events/ Sponsorship Package Welcome! Corpus Christi American Bank Convention Center - 1901 N. Shoreline Blvd. Supplier Information Information Kit Kit SUPPLIER EXPOSITION HOSTED BY TAMPA BAY AREA CHAPTER OF NIGP A La Carte Event Pavilion 4050 Dana Shores Drive Tampa, FL Friday, April 10, 2015 9:00 a.m. 3:00 p.m. Welcome to SkillsUSA Texas Leadership and Skills Conference and Career Expo SkillsUSA, Texas Career EXPO is more than a sales opportunity! It s an Adventure in the Park! Hope to see you in the Nation s Capital! !